Wednesday, May 4, 2011, 6:30 p.m. – 8:30 p.m.
Come to the May meeting ready to play with book structures and content. Together we will be making books for children and then donating them to Kids to Kids International. This non profit organization packs Friendship Boxes filled with handmade books and educational supplies then delivers them to children in need all over the world. For 20 years that have delivered boxes of hope and friendship to over 50 countries. Fun supplies to share like colored pencils, crayons, water colors, stamps, punches, special papers…and anything else that will bring a sense of creative fun to a book for a child. I will also accept new art supplies like crayons, colored pencils, pencils, pencil sharpeners, erasers, glue sticks, markers and scissors to send to KTKI. In early April, Gail Martin introduced a full house of B.A.G. members to Snapology, a form of unit origami using strips of paper to make complex amazing structures. Gail started us all off with folding strips of papers into equal units then unfolding and cutting these units into equally measured unit strips. The papers were then assembled into triangular units that locked together with connecting stips. The more units that connected the more amazing the structure. While some of us found this to be a snap, others were challenged by the complexity of thinking in three-dimensional forms. The best part of the evening was the colleagueship of our members all helping each other and networking at the same time. All of us left with a new appreciation snapology and the workings of Gail’s mind to fully understand the structures and process. On April 17th, the Book Arts Guild of Vermont hosted the opening session for Big Ideas, Small Books, its spring exhibtion at the Emile A. Gruppe Gallery. The exhibit features 34 artist books created by 20 B.A.G. members. In addition to celebrating the opening of the show, we honored the invaluable and generous work of B.A.G. co-founder Nancy Stone. Nancy not only helped to create an organization that offers opportunities for learning and collaboration, but has also fostered lasting friendships. We love you and you’re welcome to rejoin the B.A.G. Bookboard any time! The show is open now through May 22, 2011. You can view pictures from the opening on the B.A.G. blog. *** Save the date! We are pleased to announce that renowned book artist Daniel Essig will be coming to Vermont to offer Wooden Covers, Mica Pages, a three-day workshop from 7/8/11 – 7/10/11. Cost, location and other information about the workshop coming soon. You can find maps and directions to studios on the VT Crafts Council website. You can also download a pdf of the 2011 Vermont Open Studio Tour Guide. Please note that this is a really big file – 13.5 MB. *** Last November, B.A.G. member Marianna Holzer was featured on WCAX’s Made in Vermont. Marianna is the third in her family to work as a bookbinder – her grandfather and father did the same work. Learn more about her history and her work by watching the feature on the WCAX website. *** Jane Davies‘ new book, Adventures in Mixed Media, was officially released on April 26th. The book includes projects and techniques that guide you in your creative expression through use of collage and mixed media. Congrats to B.A.G. members Elissa Campbell and Jill Abilock, who have their work included in the book. Check it out! *** Jill Abilock of Six Loons Studio is teaching a series of basic bookbinding workshops at the Emile A. Gruppe Gallery this spring. Make your own books and journals! Learn three essential bookbinding techniques in this series of workshops. Basic Bookbinding: The Pamphlet Stitch: This workshop will cover one of the most versatile and basic bookbinding techniques: the pamphlet stitch. We will make several small models exploring different applications of this technique as well as a lovely, soft-covered journal with a wraparound tie. The class meets on May 1, 2011, 2:00 p.m. – 4:00 p.m. Basic Bookbinding: The Amazing Accordion: Deceptively simple, the accordion fold can be used alone or in combination with other techniques to make beautiful and innovative books. The accordion books we make in this class will be great for displaying poetry, photographs, paintings or drawings. 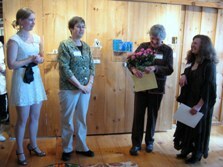 The class meets on May 9, 2011, 6:00 p.m. – 8:00 p.m. Basic Bookbinding: Japanese Stab Binding: Elegant in their simplicity, Japanese stab-bound books are also fun to make. We will make several models of different sewing patterns as well as a book with a handmade paper cover that would make a great journal, sketchbook, scrapbook or guest book. The class meets on May 14, 2011, 2:00 p.m. – 4:00 p.m.
Fee: $40.00 per workshop, $100.00 for all three workshops (includes all materials). Bookbinding tools will be provided for use. For more information or to register, please contact Jill Abilock via Email or phone: (802) 238-0883. Know When to Fold ‘Em: While the basic accordion book is easy and quick to produce, it can be adapted into more complex and creative books. In this workshop, participants will create several books based on the accordion structure – the basic accordion, panel book, the flexagon, and the flag book. The class meets on May 19, 23 & 26, 2011, 4:30 p.m. – 7:30 p.m.
Know When to Fold MORE of ‘Em: In this “sequel” to the Know When to Fold ‘Em workshop, participants will create several books based on the accordion structure – the nested accordion, the star book, and the tunnel book. This intensive, one-day workshop meets on June 13, 2011, 9:00 a.m. – 4:30 p.m.
*** Sarah Smith is teaching a series of book arts workshops for the Continuing Education program at Simmons College’s Graduate School of Library and Information Science. Bookmaking for the Beginner 2: This workshop explores multi-section books and sewing techniques. Structures included will be supported sewings, such as long stitch and sewing on tapes; exposed sewings, such as the Coptic binding and the Secret Belgian Binding. Some basic pop-ups structures may also be covered. The class meets on May 7, 2011, 9:00 a.m. – 5:00 p.m.
Pop-up Books: This workshop will help you understand some of the basic ideas behind the history and production of pop-up books. After a discussion and slide talk covering the history of pop-up books, be ready for some hands-on exploration of some basic pop-up structures, including making a few examples of your own. The class meets June 11-12, 2011, 9:00 a.m. – 5:00 p.m. Registration for these workshops is available online. For more information, please visit the Simmons College GSDLIS website. *** The Shelburne Museum will host the exhibit Paperwork in 3D, featuring the work of 25 contemporary artists who transform flat sheets of paper into amazing three-dimensional art. The exhibit opens on May 15, 2011. On exhibit in the Round Barn, Kalkin House, and the Lighthouse galleries. From mid-June to mid-August daily scheduled activities in Kalkin House help visitors explore many of the artistic techniques used by the artists in the exhibition. Featured artists include book artists Tom Allen, Brian Dettmer, Sam Ita, and Matthew Reinhart. *** The University of Vermont‘s Spring 2011 exhibit, Beyond the Text: Artists’ Books from the Collection of Robert J. Ruben, is on display in the Bailey/Howe Library lobby. The featured artists’ books were selected to provide examples of different forms and media, with an eye to high quality. There are accordion books, scrolls, box books, pop-ups, and tunnel books that have known texts, new texts, or no text at all. Both materials and subject matter vary from book to book.